Item description: Pencil drawing, dated 10 April 1862, by Herbert Eugene Valentine of Salem, Mass. Valentine served as a clerk in the U.S. 23rd Massachusetts Infantry Regiment, spending time in New Bern, N.C. Valentine made numerous drawings of the places in which he was stationed during the war including this image of ships on the Trent River. Item citation: From volume 1 of the Herbert E. Valentine Papers #4397, Southern Historical Collection, The Wilson Library, University of North Carolina at Chapel Hill. 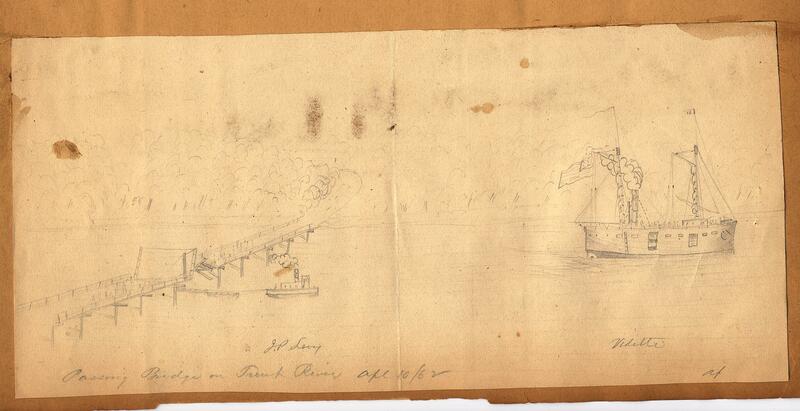 This entry was posted in Southern Historical Collection and tagged 23rd Massachusetts Infantry Regiment, Battle of New Bern, drawings, Herbert Valentine, illustrations, Massachusetts, New Bern, North Carolina, Trent River. Bookmark the permalink.